Let's Remember Willie -- and do it right! The Community Rejuvenation Project is a DBA for HIgher Gliffs, a federally recognized 501(c)3 non-profit organization. Our EIN# is 36-4319738. Contributions are tax-deductible for income, gift and estate taxes. In honor of a community treasure who was a model for us all. Willie Pickens was a gift, a treasure. The mural and it's location are perfect - I'll never forget Willie and Irma's kindness, welcoming me (and my brothers) and other church members into their home for weekly Bible study and showing us by their spirit what true wisdom, grace, hospitality and community are all about. Willie & Irma, Beloved role models of love, faith and dedication, nurturing talent and souls. Thank you, Willie, from the Mosena family! Proud to contribute to Willie Pickens' legacy - what a lovely tribute! I had the honor of knowing Willie Pickens for the past 13 years. His kind smile and dedication to teaching music were a blessing to our community. In honor of my parents, Gene and Genie Huffine, who were friends and fans of Willie. May Willie's memory be a blessing to all. In honor of my freshman music teacher at Kenwood H.S. in 1967. #Bronco4Life and family. 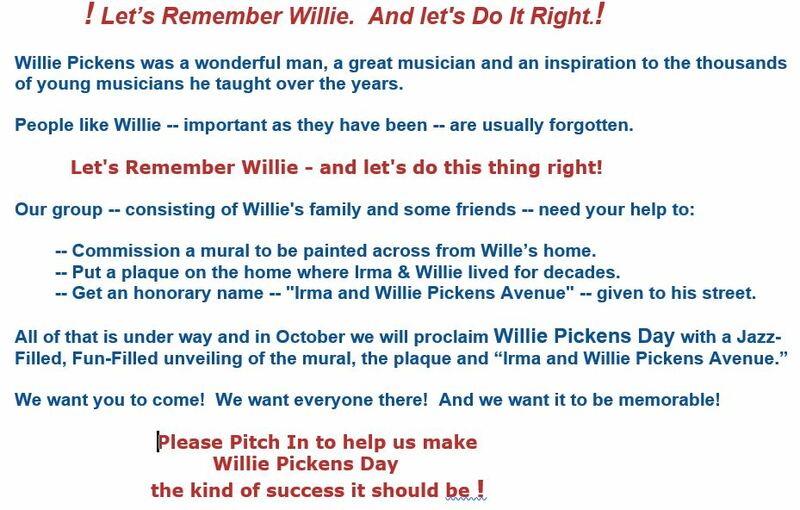 An addendum to my earlier comment under Judith: Special remembrances and thanks to the wonderful Irma Pickens, who provided the environment for Willie to make his beautiful music both in and outside of Hyde Park. This donation is made on behalf of myself and my children, John, Rebecca, and Kevin. Our kids thought of Irma and Willie as their aunt and uncle; they were family. It is fitting that the mural should be at Ray. It would be nice if Desi could find a way to include Irma in the mural as she was a fundamental part of Willie’s success and made important contributions to Ray and the HP community. Please add this modest donation to my earlier donation, which skipped ahead before I had a chance to add my comment, which is: I didn't know Willie well, but benefitted greatly from having him as a neighbor and from his music, friendliness and generosity. He is much missed! I am happy to contribute to his memorial to insure that others will know of his legacy! I look forward to remembering the wonderful Willie Pickens every time I walk by this beautiful mural! To Willie for making such beautiful music both in and out of Hyde Park. Happy to support the celebration of this legend whose work brings honor to our community.